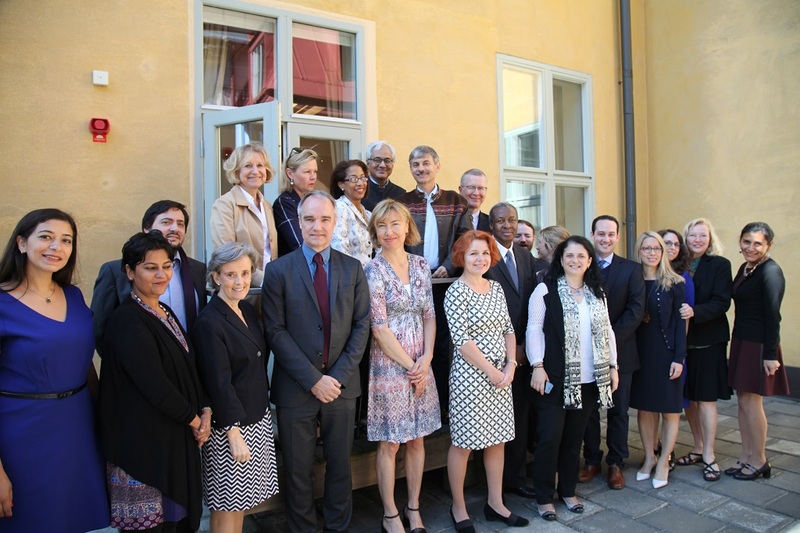 Stockholm, 10 June 2016 - On the year of the tenth anniversary of the UN Study on Violence against Children and as the implementation, follow-up and review process of the 2030 Agenda takes shape, SRSG on Violence against Children Marta Santos Pais convened the 6th Cross-Regional Round Table on the prevention and elimination of violence against children of regional organizations and institutions in Stockholm on 30-31 May to discuss the regions’ role in supporting efforts to reach the violence-related goals and targets agreed upon in Agenda 2030 on Sustainable Development. At the conclusion of this year’s annual forum, regional organizations and institutions participating in the event committed to accelerating progress in achieving the violence-related targets of Agenda 2030, especially target 16.2. “Guided by this ambitious vision and energized by the resolve and action of regional organizations and institutions, we can together help shape the road ahead, making violence against children history: there could be no better way of celebrating the tenth anniversary of the UN Study on Violence against Children!” highlighted SRSG Santos Pais. Acting as a bridge-builder between regions, SRSG Santos Pais convenes an annual Cross-Regional Meeting on violence against children with representatives from regional organizations and institutions. This important forum provides a strategic platform to assess progress achieved, reflect on trends and common concerns, and identify opportunities for cross-regional cooperation. Co-organized with the Council of Baltic Sea States, the focus of this year’s Cross-Regional Roundtable was “Ending violence against children: The vision and implementation of the 2030 Agenda for sustainable development”. Speaking at the opening of the Round Table, SRSG Santos Pais highlighted that “regional organizations and institutions are crucial catalysts of progress for the prevention and elimination of violence against children at both the regional and the national levels. They provide a strategic bridge between international commitments and national realities, and play an increasingly important role in informing and facilitating the cross-fertilization of experiences and lessons learnt, and the scaling up of positive experiences”. One of the themes emerging from the dialogue between different regions was the importance of recognising the interconnected nature of the roots of violence, which are mirrored in the interconnected goals within Agenda 2030. Framing the elimination of violence against children as both a human rights imperative and an issue of human development, participants recognized that the holistic vision and approach of the sustainable development goals was required to prevent and address violence against children in a comprehensive way. There was agreement on the different facets of such an approach, including investment in prevention and the high return for society in eliminating violence against children, the enactment and enforcement of strong legislation, and the need for a multifaceted policy agenda with well-coordinated and well-funded action. Echoing one of the guiding principles of Agenda 2030 – to leave no one behind – the annual meeting with regional organizations and institutions also committed to address the significant challenges that continue to hamper children’s protection from all forms of violence with a particular emphasis on the most vulnerable, including children who are seeking asylum, who are refugees, those affected by migration, children deprived of their liberty, children with disabilities, children with albinism and those living on the street or in extreme poverty. As emphasized by SRSG Santos Pais “The new Sustainable Development Agenda is global and universal; it is to be implemented by all countries, in all regions, and it has a unique potential for win-win cooperation and to bring gains to all parts of the world. But more importantly, it concerns all children and has the ambition to reach those furthest behind first. This is why it calls on all nations to give priority attention to the most vulnerable groups in society and to assess success in light of progress achieved for the most invisible and forgotten children, those who are also at most risk of violence, abuse and exploitation”. It was precisely to energize and inspire such action that SRSG Santos Pais and other partners launched the High Time to End Violence against Children initiative during the March session of the Human Rights Council this year. The initiative is an innovative talent and time raising effort aimed at stimulating and supporting positive, visible and concrete initiatives designed to end violence against children worldwide, for which regional organizations and institutions committed to mobilizing support. As part of this initiative, SRSG Santos Pais hosted a public roundtable following the Cross-Regional meeting during which important initiatives on violence prevention and elimination were addressed, including on children’s protection from trafficking and sexual exploitation on travel and tourism, and on children’s contribution to these efforts. The 2016 Cross-Regional Round Table on the prevention and elimination of violence against children counted on the participation of the Association of Southeast Asian Nations (ASEAN), the Central-American Integration System (SISCA), the League of Arab States, the Inter-American Children’s Institute of the Organization of American States (IIN-OAS), the Latin-American and Caribbean Movement for Advancing the Protection of Children from Violence, the South Asia Coordinating Group for Ending Violence Against Children, as well as the African Child Policy Forum.